While I was in college, I used to deliver pizzas at Pizza Hut as a part-time job. It was pretty common for me to work about 20 hours a week and deliver pizzas for 4+ hours on the weekends. Delivering pizzas was quite a relaxing job. Sitting in your car most of the hours, listening to music, and driving around the neighborhood. After growing weary of listening to the same music during my work shifts, I started to download and listen to podcasts. I searched up popular podcasts and began to tune into the Joe Rogan Experience, a podcast hosted by American comedian, actor, sports commentator, and television host Joe Rogan. The show was great because Rogan would interview all sorts of guests for his podcast and have conversations on whatever topics the guests and he were inclined to talk about. One episode I listened to had a wealthy American street artist, David Choe, on it. Joe Rogan and David Choe spoke about their experiences and the benefits of the herbal plant medicine, ayahuasca. This was my first time ever hearing about the medicine. How could something this powerful even exist? It sounded like some magical mythical potion from a movie or a videogame. I was immediately intrigued and after I finished my shift, I started to research as much as I could about ayahuasca. All ayahuasca is, is a mix of plants and other ingredients that produce dimethyltryptamine (DMT). DMT is a powerful hallucinogenic we all naturally produce in our bodies. However, it is only released when we are born and when we are about to die. It is why people claim to see their version of God when they are about to die. It is a relatively safe medicine as it takes about 20 times the normal dose to be life-threatening. According to my research, it is safer than alcohol. Amazonian tribes have been using the power contained in the plant brew for centuries. Apparently, there were ayahuasca retreat centers out in places like Peru, Brazil, and Ecuador that hosted ayahuasca ceremonies. People from all over the world that would travel to these places just to take ayahuasca to find their purpose in life, live more authentically, commence in a spiritual journey or to heal their past traumas. The retreats are led by shamans. A shaman is regarded as someone who has access to the spirit world. Ayahuasca retreats included ceremonies where attendees and the shamans sit in a hut and drink ayahuasca to enter the spirit world. A friend I met while I was traveling out in Thailand when I was 20 years old, Chris, was starting a Men’s transformative ayahuasca retreat company. His company’s purpose was to lead guys to heal their past traumas, offer some guidance through their life, and help them live more authentically by using this herbal medicine. This was a passion project of his and he was collaborating with a shaman he had personally vetted and trusted. Chris reached out to me to participate in his first ever men’s ayahuasca retreat in Ecuador and I immediately knew I wanted to participate in it. I have had my fair share of domestic violence incidents, childhood traumas, was hit by a car, and I overcame some severe mental illness in college. I had a feeling I would benefit a lot from taking the plant medicine. 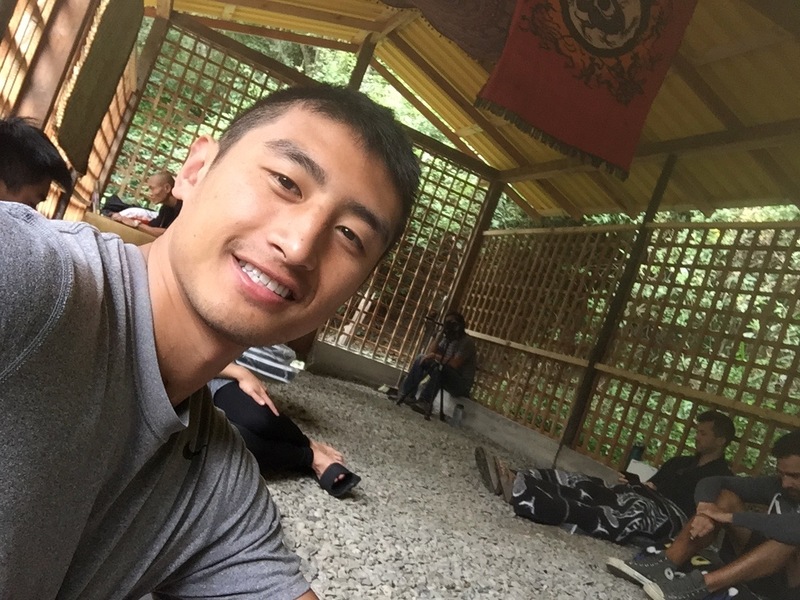 Luke Hancock, a self-empowerment coach I met in Chiang Mai, Thailand informed me that taking ayahuasca was the most liberating experiences of his life and he believed it would help me a lot with my healing. I booked my plane ticket to Ecuador and did not look back. A group of guys and I all were in the jungle at the Casa Del Sol Vilcabamba ayahuasca retreat center in Ecuador. We strolled inside an outdoor wooden hut that was proclaimed “The Dojo”. There were blankets, little cots laid out, a fireplace in the middle of the room and tiny buckets just in case we had to throw up. Musical instruments clattered and melodies filled the room. Our ayahuasca retreat shaman began the ceremony by giving a short speech and then singing a few ancient songs. The shaman called each attendee up, one-by-one to give them the brew. My name was called and I timidly got up and steadily walked to the shaman in the dimly lit room. The shaman carefully handed me the cup of the supposed life-altering concoction. For the next hour, I sat in the dark on my cot perplexed. I scratched my head and wondered if the medicine was all hype. I stared at my bucket and at the other men in the dark room. I nervously waited as time continued to pass. Then—my stomach churned in agony. Black sludge filled the bucket beside my cot. I spilled my guts out. My body hunched over as vomit continuously left my mouth. I wondered how much more substance I had left in my body. The shaman had warned us about throwing up. He called this process “purging”. I recall questioning myself on why I had poisoned my body while I was incessantly vomiting. I looked up into the center of the room and intense visuals appeared in my head. Almost as if vomiting… had activated the ayahuasca’s effects. I saw energy waves from the music and my surroundings were so vibrant with colors and patterns. The world revealed itself to me in its purest form–energy. Then, I felt uneasy and uncomfortable in my own skin. My heart raced as I squirmed relentlessly while sitting down on my cot. My body had entered a fight or flight mode. Sweat rapidly ran down my body and my heart started to beat out of my chest. I tried to breathe but I felt like there was not enough air. My hands frantically pulled against my skin as if I wanted to tear my skin off and leave my body. I restlessly rocked back and forth, sick to my stomach. Soon after, my mind was swallowed and engulfed into another gloomy dimension. It felt as if I was now stuck in a womb. I had all but forgotten where I was, who I was or what I was doing. All I knew was that I was stuck in a womb and I wanted to get out. In a desperate frenzy to escape, I crawled to the fireplace in the middle of the Dojo and started to scream. A deep long breath, and then a banshee-like shriek, over…and..over..and..over…and..over again. My screams echoed off the trees and through the black abyss of the night. The room was tense as everyone inside observed me with worried faces. “Remember what we practiced Brandon— breath–look into the fireplace” — Chris said in a stern voice as he tried to calm me down. Soon, other attendees and members of the retreat surrounded me in an attempt to comfort me. My peers cleared the way as I continued my screams. In the midst of my shrieks, I remember thinking to myself how pure these screams were. There was no resistance. Nothing holding these piercing cries back. Like I released just pure pain…deeply rooted in my body. I heavily screamed nonstop for an hour. Everyone in the room stared at me wide-eyed as they watched me bellow. After the hour, I started to calm down. “I can breath? !” I said out loud as I desperately gasped for air. When I peered back into the center of the room at the fireplace, rich bright lights filled my head. It was as if… I had teleported to heaven. Vivid white light and blue sky–as far as the eye can see. It was so alluring. The next thing I know, my soul left my body. My consciousness floated outside of my body and I appeared before myself. In disbelief as I stared at my own physical structure of myself in front of me. I was free… In pure bliss and serenity as I soared across the blue skies created from my mind. It felt as if I was a playful child reborn. A subtle calm filled my heart and my body felt as light as a feather. I felt at ease with my past…almost like the traumas had occurred to me in a past life. It was the weirdest feeling. Like those screams cleaned and polished my soul. -Brandon Leuangpaseuth is a writer from San Diego, CA, who helps various drug crimes attorneys with their public relations. You can connect with him on Linkedin @ bleuangpaseuth. Glad you enjoyed it, Jack. Appreciate the kind words.